My Big Fast Car Book by Ticktock. Review: Do you like looking at fast cars and envy the people who have them? If so this is the book for you. It shows a couple of the fastest cars in the world. You see muscle cars, hot rods, and sport cars all made by top of the line retailers. My Big Fast Car Book has a lot of interesting facts; did you know that a Bugatti Veyron goes 267mph and costs 2 million dollars, and that the most expensive car sold for 35 million dollars? These are some of the things that I liked about My Big Fast Car Book. This is one of my favorite picture books I have ever read; this book shows the price of fancy cars, how fast they go, and what they look like. 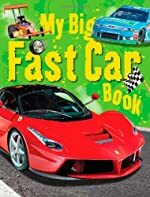 I recommend My Big Fast Car Bookto preschoolers and nearly anybody under the age of 10 who loves cars because it is filled with cool cars and a lot of details. Review written by Patrick (6th grade student). We would like to thank Ticktock Publishing for providing a copy of My Big Fast Car Book for this review. Have you read My Big Fast Car Book? How would you rate it?